How Much Does A Mortgage Broker Cost? 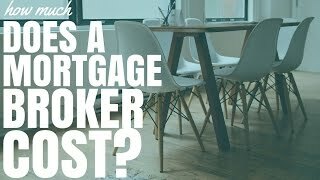 How Much Does A Mortgage Broker Cost? Mortgage brokers help you choose the best loan for your situation but how much does a mortgage broker cost? Mortgage brokers are my favourite way to choose a loan. They help you choose from a myriad of lenders they do a lot of the work for you which makes it a lot so much easy. In most cases the service is actually completely free and I am going to explain to you why they are free. A mortgage broker doesn’t get paid by you they get paid by the bank or the lender that you choose to get your loan with. Mortgage brokers are paid through an upfront payment which comes from the banks or lenders, which occurs after you sign on. More on how much mortgage brokers make per deal. They also get what’s called a trailing commission. As long as your loan continues to exist and continues to be serviced, they get a tiny piece of that pie. The great thing about mortgage brokers is they don’t actually add any cost to your loan but they do a lot of the work for you. My favourite thing about mortgage brokers is that they understand all of the loan documents and fill a lot of these out for you. I absolutely hate that stuff! They also give you access to multiple lenders (usually between 25 to 30 different lenders) and all the different loans that all those lenders have. Sometimes it’s upwards of 800 different loan options that they can give you, rather than if you just go to one bank and you only get a couple of different loan options. So mortgage brokers can see from the full spectrum of loan options that are out there. Whereas if you go to one bank they’re just going to try and sell you on exactly what that bank does. So seeing a mortgage broker out can help you lower your costs of a mortgage, help you increase your borrowing capacity by choosing the lender who gives you the best borrowing capacity and the best thing is that in almost all circumstances they do it all for free.